This weekend our firewalls were replaced with us moving from one vendor to another. This took a little longer than required due to some issues with rules & inside outside definitions, but my colleague was more than up to the challenge. This change required our VPN config profile to be re-pushed, it seemed to work. But further testing revealed we had an issue. Cluster was being seen within JSS. Clients could enrol & get Config Profiles. 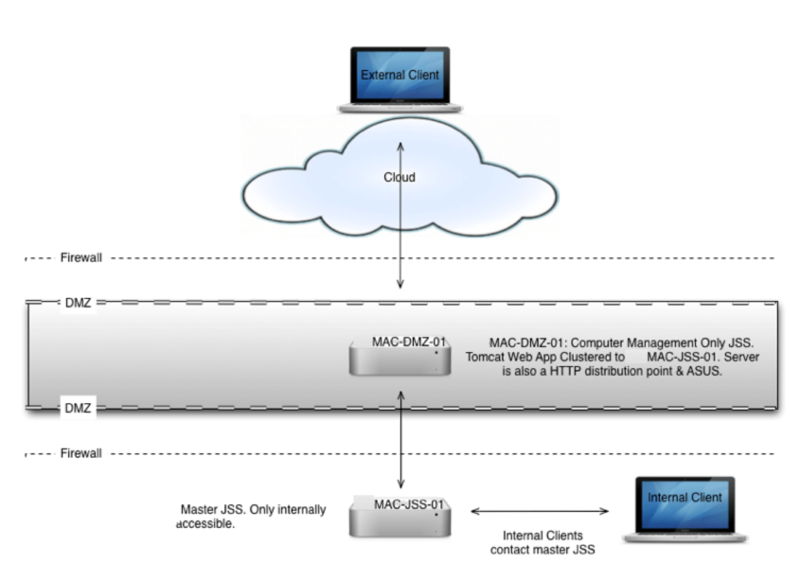 DMZ could telnet Master JSS on port 3306 for MySQL. Both DMZ & Master JSS Macs could telnet the 3 addresses below on the ports given (from this Apple Tech Note). After a fair bit of checking & re-checking, I re-ran the JSS Installer on the DMZ server. This resolved the issue for me. I’m guessing that as the DMZ lost connection with the Master JSS for a period of time, something had bombed out. Below is a image of our cluster, to help you visualise our setup. If it happens again, I’ll attempt to delve deeper.